AllegroMedical.com presents The Sennheiser TV Listening System Neckloop. The Sennheiser TV Amplifier Neckloop is ideal for hearing aid wearers. It can be used with Set 830S and Set 840S receivers. It is directly connectable to a TV, hi-fi system or radio. 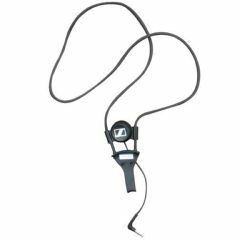 The cordless neckloop offers outstanding sound quality, which, for example, can be customized to the listener's hearing ability thanks to treble emphasis. Sound can be transmitted from the receiver to the hearing aid be means of wireless induction using the induction loop. Alternatively, induction couplers or headphones can be connected to the lightweight receiver. Lithium polymer battery for up to 12 hours of continuous useWhat is an IR (infrared) system? IR, or infrared systems, transmit sound via invisible light waves within direct line of sight. There is added security in an IR system because sound cannot "spill over" to other rooms. Many multiplex theaters use IR systems for that reason.